Have you ever wondered why other people act the way they do - or just wanted to know how to co-exist with them in a better way - or wanted to organize a team of people for optimum results ? The Enneagram MASTER app can be used to understand specific Enneagram Relationships and development, and therefore has long descriptions of different Enneagram type parent connections and each Enneagram Types Path of Development with themes. Explore Enneagram Spirituality. The Enneagram is a typology of 9 different personality types that explains 9 different deep rooted behavioral and thinking patterns, which can give you the insight and the ability to change your own limiting actions. You will be guided through selected statements of The Enneagram types, giving you insight and awareness of the way your own mind and behavioral patterns are, and then consecutively how to co-exist and co-operate with other people in a better way. 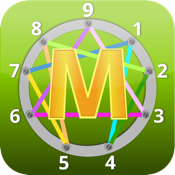 The MINDSETMAX technology has been founded by Mr. John Rhodes, Enneagram Trainer and Enneagram Coach. Personal development is an individual process. Mindsetmax as an organization, Mindsetmax employees, or any content within the apps – cannot be held liable for the meaning or feelings you experience when using our apps. The sole responsible person for your personal development is YOU, and only YOU. This app, being a self study, is NOT a substitute for participating and interacting with other people in a well renowned Enneagram course physically supervised by at least a certified Enneagram Trainer. This app is intended to assist the Enneagram student before, during and after becoming certified as an Enneagram Practitioner, Enneagram Master etc. Striving for excellence in any field, requires hours, months or even years of practical real life application after the education – ie. being Enneagram certified – has ended. This app therefore does NOT in any way, certify you to setup a practice using Enneagram theory or Enneagram Techniques on other people.